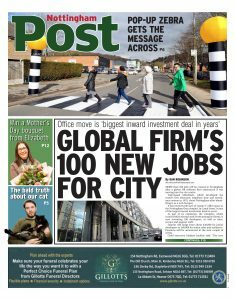 Press For Attention PR, the Nottingham-based B2B PR specialist, is celebrating a decade of hitting the headlines by launching a new copywriting division, to be led by local expert Martin Rockley. Rockley has worked as a copywriter for over 30 years with a varied portfolio of blue chip clients in a wide range of B2B sectors, including HSBC, British Gas, Experian, British Canoeing, Boots and Willmott Dixon. Press For Attention PR’s clients include Paragon Interiors, Impero Software, Biocity, In Phase International, NG Chartered Surveyors, Distinct Recruitment and Bygott Biggs. “Press For Attention PR focuses on thought leadership, essentially showcasing our clients’ expertise and with that comes a whole range of possibilities when it comes to content marketing. “I’ve worked with Martin in various roles ever since I came to Nottingham around 15 years ago and I’ve always been impressed by his ability to hit the nail on the head when it comes to copy. I celebrated my 10th anniversary of business on April 1st. Yes, the date was intentional, after all, who else would try and start a new agency during the crash of 2008? I have learned a lot in the last decade that can make a real difference to your PR campaign. You don’t care that my hair is a little greyer but you might care to take a look at the 10 tips I’ve outlined below. They are in no particular order but hopefully you will find them useful to help drive your PR campaign this year. 1.Think win/win/win. That’s right. There’s 3 sides in every story. Your side, your audience’s side AND the media’s side. Make sure everybody gets something out of it. 2. Think in pictures. Editorial photography is an investment, not a cost. If the photo you provide looks dull, why would the media use it versus a similar story with a better photo? 3. So what? What changes? Make sure that whatever it is you are communicating makes a difference to the reader, not just your ego. 4. Beware coffee table coverage. It might look great on the wall or in reception but does the coverage you get actually drive attention from your target market? The Times isn’t the goal for everyone. 5. Who needs to know this? Make sure you know your target audience and you know that what you are telling them is interesting, entertaining or informative. Why not all three? 6. What do they NEED to know. Be clear in the message you are trying to convey. Your audience should be able to tell someone next to them what just happened. 7. Why are you doing this? Do you have a strategic goal for your PR campaign or did you just think it was ‘about time we did something’? Make sure you are clear on your objectives. 8. Timing is everything. Don’t plan an elaborate PR campaign launch as you are about to go on holiday or if you cannot cope with demand if it suddenly peaks following coverage. 9. Think like a journalist as well as a marketer. Get in the heads of your target media and see how you can help them to sell more copies or clicks thanks to your useful content. 10. Don’t give up. It may take you a while to gain some traction with the media but if you follow the rules above, if you play the game so that everyone wins, it will be worth the effort. So here’s to the next 10 years and whatever new challenges they will bring. Maybe I can help you with some of yours. As Jamie Carragher is now painfully aware – ‘Believe in better’ is Sky’s slogan. It has served them well, especially with the creation of the best punditry partnership on TV, Jamie Carragher and Gary Neville. The former foes, legends for their rival clubs, Liverpool and Manchester United respectively, have forged a fantastic partnership based on solid tactical knowledge, a passion for the game and of course, their relentless rivalry and ribbing of one another. It is classic ‘bants’, a laddish atmosphere that genuinely adds to the spectacle – if you like football anyway. Carragher’s behaviour, however provoked he was by the oik driving alongside him, cannot be dismissed so easily. There is something utterly disgusting about spitting. I see it in the street a lot, mainly young men, absentmindedly spitting as they cross the road or just standing around looking vacant, drooling in onto the pavement. It is pretty grim at that level but to spit AT someone. Utterly vile. Now, I highly doubt Jamie intended to spit at a 14 year old girl. It was a reaction, plain and simple. Disgusting but not a measured assault. However, as a man in the public eye with an employer that is focused on family entertainment, it was always going to be judged to a higher and harsher standard. He has actually been superb in terms of his PR crisis management, admitting guilt, being contrite, being proactive in all of these apologies and even pleading on social media for the family to be left alone. He has called it ‘a huge mistake in a moment of madness’ and it truly was. He has now paid for it. Sky have just announced he will be suspended until the end of the football season. To be fair to Sky, I cannot see what else they could have done. If it had been anyone else, a newsreader for example, they would have done the same. The fact that it is one of their best and highest profile pundits means it will hit them hard but with a slogan of ‘Believe in Better’, you have to walk the walk. PS – I’ll be interested to see if any bold broadcaster selects him to be on their World Cup team. How do I improve the ROI of my PR? This is the front page of my client’s local newspaper this morning. Talk about return on investment for PR! It features a story we have worked on for over a month, getting quotes from supporting parties and stakeholders, positioning my client at the heart of the deal and essentially telling their market that if you want results like this, you really should be talking to them. It is FANTASTIC coverage for them but is it just tomorrow’s fish and chip paper? Well….YES. Yes it is, if that is ALL they do with it. However, they won’t do that because we are going to leverage it. We are going to shout if from the rooftops via their social media. We’re going to get the story out across their e-newsletter. I’m going to use it to offer them up for further expert market comment. And then, here’s the real genius. Here’s the secret sauce that is going to really power this PR campaign.. They are going to buy copies of the paper and PUT THEM IN THE POST. That’s right, they are going to go back to the marketing ‘Stone Age’ and actually post a letter. There’s going to be ink, a pen and EVERYTHING. Whisper it but there’s going to be a hand addressed envelope. You see, coverage like this, third party testimony from a trusted source, a newspaper, is like gold dust. It is the best sales brochure they could send out right now to their prospects. Not their suspects, I’m talking about the people who have been in touch before, kicked the tyres, asked them to keep them posted, expressed interest, you know the drill. Sure, press coverage is often the goal of your PR campaign but this is how you take it to the next level. You share your good news. Look carefully and you’ll see that is what I am doing now. In fact, I’m off to buy 10 copies myself to send to MY prospects. Now do you see how to leverage PR? If you would like more free PR advice, you could do worse that to take a little look at this. Greg • No Comments on How do I improve the ROI of my PR? Cluckin’ Hell – they’ve only gone and got away with it! In terms of a PR crisis, running out of chicken when one is synonymous with the stuff is a zinger of a problem. The last thing to do is to try and wing it…in times of crisis comes threat but also opportunity. The threat to reputation but also the opportunity for a big brand to show its human side. That’s what KFC has done and it has paid off in bucket loads. That pretty much sums it up. As does the frankly brilliant FULL PAGE ad with the clever reworking of the KFC logo. Yes, when it comes to fronting up, KFC has played a blinder here. Now, you know the old phrase, no such thing as bad publicity….well, that’s utter rubbish BUT if you handle it correctly, it needn’t be a nail in the coffin. KFC’s purchase consideration score (would you consider buying from KFC?) has stayed solidly at the 18 mark, underlining the limited damage to the brand but its word of mouth score (whether you have talked about the brand with friends or family) has jumped from 11 to 37. It has been handled superbly and may well be the start of a new opportunity for the brand to engage with the public. The key now will be to maintain this tone if they want to extend the feelgood factor, keeping and indeed winning new fans. If you are facing your own PR crisis or have given thought to what you might do, have a read of our article here for a grounder in PR Crisis Management. The secret is all in the preparation, not in winging it. Greg • No Comments on Cluckin’ Hell – they’ve only gone and got away with it! Your media reputation, can you handle the truth? Do you know what your target media thinks about you, your brand or your business? Have you ever thought to ask them? Now, this may sound scary and at times even be a bit uncomfortable BUT if you are going to run a PR or marketing campaign properly, you need to start with a baseline. Let’s imagine you buy into this, where would you start? With the people who already write about you or who you WANT to be known by? Maybe. Sounds perfectly sensible and fairly easy. However, might I suggest you start with the people who your customers actually read? The media that will help inflate your profits, not just your ego. Ask your target customers what they read, who they follow, what they listen to. Do this via an online survey with a prize draw opportunity or added-value product or service from your business to encourage take up and even, subtly sell your products and services right there. You know, a bit like I’m doing now. Then, and here’s the kicker folks….ask them how you can help them better. Far too many people see Public Relations as a one-way street, a chance to wangle a marketing message into the media. Now, it certainly can do that for you but the professionals do it another way, we strive to become a partner with the press, a provider of genuinely useful content, be it news or views, that the media will thank you and reward you for with that much coveted coverage. Now, there’s a bit more to it than that but in a nutshell, that’s what you should do. Of course, we can do it for you and typically we charge between £250.00-400.00 for this service BUT if you drop me a line before the end of March 2019 I can do the media outreach part this for you, professionally, for free. NB – UK businesses only and you need to be a trading business of course otherwise there is no reputation to go on. If you want to do this yourself, just go for it. It will pay off in spades in terms of customer outreach as you are getting in touch and seeking their valued opinion and might just spark off a press opportunity right away. PS – I tend to do this when I have a news angle to announce in the very near future for my client. I won’t give it away but I am warming them up to expect something soon. Cunning eh? Greg • No Comments on Your media reputation, can you handle the truth? Who will you break up with this Valentine’s Day? It’s not you, it’s me. We’ve tried but it just isn’t the same anymore. It would be best for us both if we just moved on. Feel good? Maybe you have a bit of a nervous feeling in the pit of your stomach? What if you took this honest approach to your marketing? Especially with your newsletter subscribers. We’ve all heard of GDPR by now and there is a lot of fretting and faffing going on. Many people are worried that they will lose a huge number of subscribers. I totally understand. Now, this is going to sound harsh but this might be for the best. Forget the whole GDPR stuff for a moment. Maybe they don’t WANT to hear from you. Maybe they are just being polite and not unsubscribing and they are just quietly ignoring your messages or simple deleting them. Well, with GDPR, you now have the perfect excuse to break up. You can actually ask your list if they still want to hear from you as you are keen to ensure relevance at all times and that you are being useful to them. You could even crowbar in the phrase ‘best practice’ if you like that sort of thing. If you aren’t being relevant or useful, you could ask them what they would prefer. Maybe they want a clean break, no hard feelings. Maybe they want to hear from you less often. Maybe they don’t actually recall you from that first date long ago. Maybe, they don’t think they ever asked to hear from you thinking about it. Or….maybe they will say WAIT DON’T LEAVE ME – I CAN CHANGE. Well, good news, now you can get together for a coffee and a chat again. GDPR is a very dry subject but you don’t have to treat it like that. Sure, you can see it as a threat and worry about your number of ‘subscribers’ dwindling or, you could see it as a way to focus on your actual prospects and forge better engagement with them. I will be sending this out to my database actually asking people if they want me to stop messaging them. Will I be heartbroken if I lose a tonne of subscribers? Well, maybe a tiny bit, we’re all human BUT I know I will be more delighted to know that those who still want to hear from me have told me they do and that I can now concentrate on better serving them. They might even want to hear from me MORE. Marketing isn’t about ‘spray and pray’ it is about being useful to your suspects, prospects, leads, customers and clients. If you can add a bit of humour in there too, even better. Just don’t take it so personally if you have a few break ups over this. You were never quite right for each other in the first place and deep down, you know it. Greg • No Comments on Who will you break up with this Valentine’s Day? It’s that time of year when we’re making resolutions. Whether health, wealth or just plain happiness, we’re all at it. Of course, to do these properly, we need targets or good old ‘goals’ if you prefer and crucially, we need to know where we are starting from. This should be the case with your PR efforts too. You may have a resolution to make a more strategic effort with your PR campaign or perhaps you want to rekindle a campaign that spluttered out a little last year? Perish the thought but maybe you didn’t do ANY PR in 2017 whatsoever. It has been known. As we all know, what gets measured gets managed. So, what might you measure with regards your PR efforts this year and against what benchmarks? You might look at how many stories you published and issued and how many got used. This is what we call your ‘hit-rate’. How well did you do? For some, the figures will be reassuringly high. I pride myself on a 100 percent hit rate for my clients but that’s my job and I will only release stories I know will get covered and make a difference for my client. You may have different pressures. What about the amount of stories you started but honestly, never finished? Maybe time got the better of you or the moment passed? Perhaps you lacked a decent picture or couldn’t herd the cats into place before the news angle fizzled out? This happens a lot, don’t worry. You might measure how often your pictures got used, whether your quotes were included or check out how many brand mentions you managed to squeeze in. Many people like to consider the cost/value ratio of advertising v editorial. Essentially how much you ‘paid’ in editorial resource via an agency or in-house v how much that same space would cost if bought as an advert. I do not do this, it is pretty much taboo now in PR for various reasons I won’t bore you with but it might help as ONE metric to consider. Rather than this, I’d measure the tone of the coverage. Go for quality over quantity. Does it portray your business as you would wish? Also, was the coverage in the right place? You can compare all sorts of things and even compare versus your competitors but the key thing is to go for something you can measure fairly easily that makes a difference to you and preferably you can check quarterly. That way you can address problems or embrace opportunities in a far more timely and effective manner. Finally, do you know what your target media thinks about you? Do they know you? Do they know exactly what you do? That research is incredibly powerful. We are offering the target media opinion audit worth £250 as a free service throughout January and February. Get in touch if you’d like us to help you discover what your target media thinks and knows about you. Book a call with us now. So, Sir Steve, what made you get back in the boat? It’s not every day that you get to meet one of your sporting heroes. My chance came yesterday when I met the Olympic legend, Sir Steve Redgrave. I’ve been fortunate in my public relations career to have met and worked with a lot of interesting business figures. I’ve even chaired press conferences for James Caan and Sir Richard Branson. However, meeting a sporting hero feels very different, however famous he or she may be. My chance to meet him and to ask him a question came at a business conference run by Entrepreneurs Circle, a group I’ve been a part of for just under a year, to help grow my business and for whom I now write a regular column. Fielding many questions, including my own where he revealed that Matthew Pinsent was the best athlete he ever rowed with, he also explained that it was a family and career decision to get back in the boat one more time after Atlanta, that the sheer will to win was behind much of his success and that his medal from Seoul in 1988 doesn’t fit in his medal box, made by his best mate at comprehensive school. For a legend, he is incredibly down to earth. Sir Steve certainly had huge natural talent but he had to step up and challenge the norm to get to where he got to. It is no good just improving a bit to catch up with your rivals, they will be doing the same, maybe more. To make the GIANT leaps required to close the gap and overtake your rivals, to DOMINATE as he and his Great Britain colleagues did for so long, means you have to embrace change. He explained that the team’s original training schedules were not closing the gap on the top nations. He wanted to do something differently. A gamble? That depends how you view it…if the current way of working isn’t closing the gap on your goals, why not change it up? You have nothing to lose. This was part of his wider message to the business owners in the audience with me, some 300 of us. You need to set BIG goals, chunk them down into bite sized pieces and then, tweak, refine and improve to ensure that every day, you are moving towards your goal. That might be revenue, customer numbers, market penetration, new products or good old profit. The bottom line for all businesses. For me, my goal is to tell 2020 stories by 2020. If I started in January 2018, that’s 1010 a year. Call it 1000. The extra 20 on 2020 are for charitable causes. So 1000 a year, that’s 83 a month. Call it 84. That’s 21 a week and just over 4 a day. Thankfully, I started this a while ago now. It is still a hell of lot but I have a team now to help me and they know this goal. They know their role in it and they are all working with me to get there. Will we make it? I am positive we will but if we start to miss our schedule, if our performance starts to fall back, I will not be afraid to make changes to how we work and to amplify our efforts. So, what is your big goal for 2018? Share it with me and maybe I can help make it happen, especially if it involves getting your story into the press. If you want a free guide on how to do just that, you can grab it here. PS – the other question, who is taller, me or Sir Steve? Well…I’ll let you draw your own conclusions. Greg • No Comments on So, Sir Steve, what made you get back in the boat? I’ve just got back from supporting our new client, ValueLicensing at Smarter Business Tech Live – a major exhibition with nearly 200 speakers including my client. What stunned me was that I was one of very few people there from the marketing support perspective. Most exhibitors focused on getting there on time and standing on their shiny stand hoping people and prospects would drop by. That’s crazy, exhibitions can cost a fortune in both time and money. So here’s some tips about what you should or could be doing the next time you book some space. Tell your prospects and customers that you are going. They might be too or they might want to join you. Use it as a chance to have a conversation. Send them an eshot, blog about it, share it across social, drop them an email directly. Whatever you do, make sure that relevant prospects know. See if you can get a speaking slot. If you can, you need to push this HARD as it is gold dust. It is a fantastic profile boost which can lead to prospects on the day and a host of new opportunities. Try and arrange an interview with the exhibition show guide, either online, in print or both. They are keen to have as much news as possible as it helps to keep the content fresh and the punters buying tickets. On the day, arrange for one of your team to be a ‘roving reporter’ taking in the show and sharing it on social media. The organisers will thank you for sharing their show with social shares a plenty and you will be positioning yourself as an expert on the industry. If you have got a speaking slot, be sure to take ‘action’ shots of you or your colleague addressing the crowd. This builds authority for later articles and blogs. Be sure to write up a short piece for your website and newsletter summarising the key points for those that couldn’t make it. After the show is over, have an honest look at what worked and what didn’t from the stand and lead capture mechanisms to the PR and social element. Now is also a good time to pitch your expert speaker for some guest articles in relevant media. There should be list of reporters who attended that you can get from the organisers or at least the publications they work for. Pitch them first whilst the show is still fresh. I hope that helps, don’t forget, when it comes to exhibitions it really is SHOW time so don’t just ‘stand’ around. PS if you want more free PR tips and tricks, just click here.